Italian cuisine is known for pasta, gnocchi, risotto and polenta. More recently many people have come to know farro. But did you know that Italians also enjoy barley? 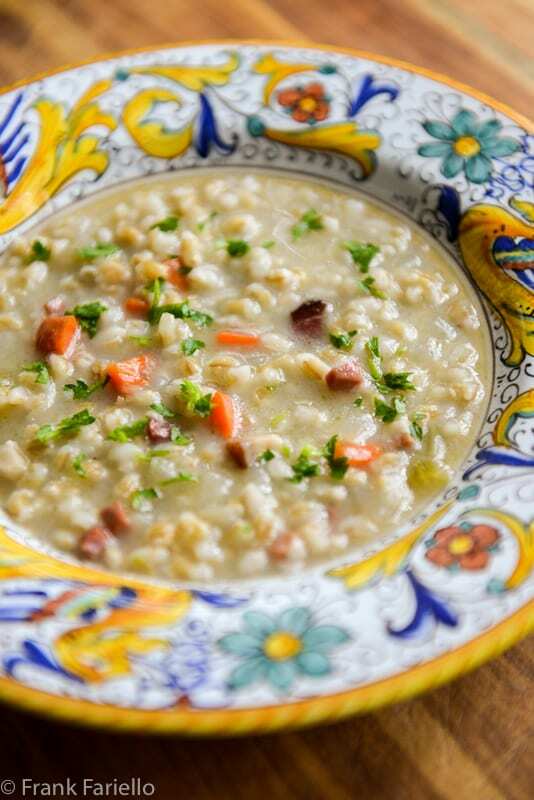 Here is a simple, basic Italian Barley Soup—zuppa di orzo— that is both healthy, appetizing and, if made in a pressure cooker, quickly prepared. Zuppa di orzo hails from the Trentino-Alto Adige, an autonomous region in northeastern Italy once part of Austria—and its cuisine reflects that history. The soup gets its special character from Speck, a cured, smoked pork product. That smoked flavor is not one that you usually associate with Italian cookery, but you can find it in this part of Italy. But leave it out—and perhaps add some cooked beans—and you’ll have a perfectly delicious and hearty vegan/vegetarian soup. Begin by making the soffritto, or flavor base: Sauté the onion, carrot, celery in olive oil, seasoning with salt and pepper and taking care not to let them brown. When the vegetables have softened, add the Speck and let it sauté for a minute or two. Then add the barley to the soffritto and let it sauté for a minute or two as well. Add water or broth to cover generously. Simmer covered for 45 minutes or until the barley is tender, stirring from time to time and adding water or broth as needed to reach the consistency you want. (NB: Barley absorbs a lot of liquid as it cooks, so do check it from time to time to avoid scorching.) The soup can be served quite thick, like a porridge, or fairly brothy as you prefer. Serve right away. If you like you can sprinkle it with parsley for color. Have some grated Parmesan cheese on the side for those who like it. Beef broth is the best choice for making Italian barley soup, in my opinion, but it is perfectly lovely with vegetable broth or even just water. Chicken broth, on the other hand, while a possible choice, in my opinion does not really pair very well with barley. Some recipes call for rinsing the barley beforehand or even soaking it for a few hours to soften it. I find this step entirely unnecessary, at least with the barley sold here in the US. If using a pressure cooker, bring up to pressure, lower the heat to a minimum and cook for 15 minutes, then release the pressure. When you open the cooker, check for liquid: if the barley has entirely absorbed it, add more water or broth and let things simmer for a few minutes more. If there is too much liquid (less likely, given barley’s aborptive qualities) then just let is simmer until you have reached the proper consistency. Zuppa di orzo can be made ahead. Many people, in fact, find it’s better the day after you make it. The character of the soup will change, however. Freshly made barley soup, given enough liquid, will remain fairly brothy and lipid. Let it sit for a while, however, and the soup will thicken up and turn a creamy white as pictured. I’ve had the soup both ways and found them both delicious. 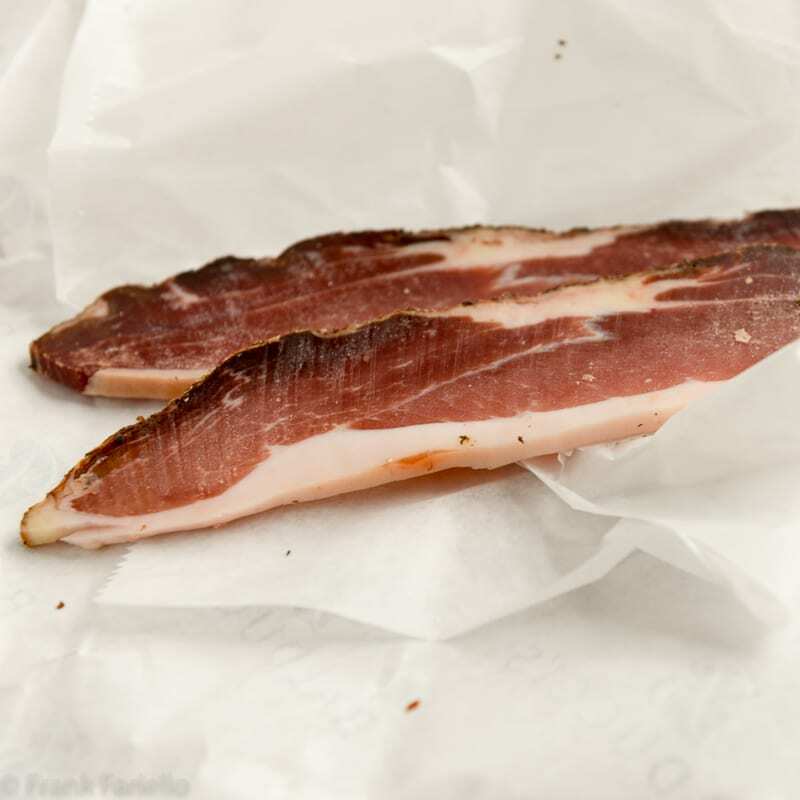 Speck is perhaps the best known food product of Alto Adige aka Südtirol, a part of Italy that belonged to Austria before World War I and still conserves much of its Teutonic culture, culinary and otherwise. To make Speck, pork thighs are salted and flavoured with a mixture of salt, pepper, juniper, rosemary and bay leaf. The thighs are then dry cured for three weeks by exposing them to alternating smoking and drying. The smoking phase uses low-resin wood so as not to give the Speck too strong a flavor. Buy your Speck in thick slices that you’ll then cut into dice when you get home. Some recipes for zuppa di orzo call for smoked pancetta—another smoked pork product from this part of Italy—either in combination with or instead of the Speck. So if you simply substituted good old smoked bacon, the taste wouldn’t be that far off, even if the taste of bacon is typically rather more aggressively smokey than Speck. I’ve even made this soup with a leftover ham bone and liked the results. This is the very basic ‘mother’ recipe for Italian Barley Soup. Besides switching out the Speck for another kind of cured pork—or omitting it altogether if you’d like a vegetarian/vegan dish—there are lots of variations you can try. You can add fresh herbs to the soffritto—parsley, rosemary and sage are particularly nice. Some recipes call for the addition of other vegetables. Potato or pumpkin are perhaps the most common, but you can also add leafy winter vegetables like kale or cabbage. Beans of all kinds—cannellini, borlotti, ceci, lentils, even peas—are also a very common addition, and turn zuppa di orzo into a perfectly rounded light supper. If using a pressure cooker, bring up to pressure, lower the heat to a minimum and cook for 15 minutes, then release the pressure. When you open the cooker, check for liquid: if the barley has entirely absorbed it, add more water or broth and let things simmer for a few minutes more. If there is too much liquid (less likely, given barley's aborptive qualities) then just let is simmer until you have reached the proper consistency. It’s been snowing all day so I decided to make this soup! I didn’t have any Speck, but I did have a few ham hocks. I don’t eat beef, so I was pleased that the vegetable broth worked out nicely. Threw in a bit of kale for color at the end. Very delicious and would make again! That’s awesome, Nova. Glad you liked it. thanks for sharing this traditional dish from my region on your blog. I just wanted to point out, that the recipe you present here is the one of the Tyrolean (and not Italian) barley soup. It has its origins in the historic region of Tyrol that got split up after WW I between Austria and Italy. Culturally speaking, we still share our Tyrolean heritage on both sides of the border (the Tyrolean dialects, our traditions and our cuisine) and this soup is also cooked on both sides of the border too (in the Austrian Bundesland Tirol and the Italian province Alto Adige – Südtirol = South Tyrol). The speck that you use in your recipe is also a traditional Tyrolean product, and not from Italian original. As South Tyrol is part of Italy now, nowadays it’s also very appreciated in all over Italy of course. Anyway, in the traditional Tyrolean barley soup (Tiroler Gerstlsuppe) we would rather use Surfleisch (salt-cured meat) instead of Speck. The latter would only be used if Surfleisch wasn’t available. I made this and it was delicious. I didn’t have bacon, but i did have a small pack of boneless chicken thighs … I cooked them up and threw them in. A little Locatelli cheese on top and yum! Perfect lunch on this snow day! So glad you liked it, Susan! I just got home from Cost Plus with some really nice Italian lentils and barley. The same brand at my Italian shop is over twice the price, so I couldn’t resist! I do so love barley and so I know I would adore this soup! Must try it soon! Frank – Your soup brings back memories of the years when I would ski in the Alto-Adige region, stopping at a refugio for a bowl of mushroom barley soup. I love the heartiness of your soup (although I’m a prosciutto and pancetta fan, but never took a liking to speck) and of course, those gorgeous bowls set it off beautifully. This dish brings memories! In Friuli, the region where I come from which is situated near Austria, we often have minestra d’orzo. So refreshing and I really like the way you have presented it! Frank – this soup is just the kind of thing we love on weekends. It’s comforting, simple, and hearty. I didn’t know that the word for barley in Italian is orzo – I only knew the pasta shape. We will definitley be enjoying this soon. Hope you guys like it, David. è una minestra tradizionale qui a Trieste, noi però ci aggiungiamo anche le patate così risulta bella densa. E’ il periodo giusto per gustarla, mi hai messo voglia di farla ! Grazie Chiara! E un piatto che piace sempre, vero? Frank, this soup brings lovely memories of our dear friends the Pisoni Family who live in Pergolese. A most comforting soup featuring speck, what could be wrong with that. I’m yet to find good Speck here in Santa Cruz but our family enjoys a good Barley soup. Yours looks fantastic, thank you. Thanks, Gerlinde! Keep looking for that Speck… the soup is already nice without it, but it does give the soup that special something. I found the speck in a fancy butcher store and I made your soup last night. It was delicious and tasted even bettter tonight. Hope you enjoy it, Cristina. It certain is a warming dish. Perfect for the weather we’re having over here right now! Just beautiful, and I’m pretty sure I ate this at a ski resort in the Dolomites, although it was spring! So, I know orzo doesn’t mean barley, so why the name for barley soup? It does. Orzo is barley. The pasta shaped like barley is called orzo or risoni according to the make. What Pino said… I was actually going to point this out in the post, as it’s confusing to a lot of Americans who know the pasta shape that so popular over here. Cooked this tonight. Well…, sort of. With smoked pancetta, smoked haddock, spinach, mussels and prawns. It was very gratifying. Can’t wait to cook it again, with different ingredients. Wow, that’s quite a variety of flavors, but it sounds fantastic. I do love this soup for its versatility—and it sound like you’ve taken to the max, Pino! Great looking soup! And I have barley in my pantry. No speck in my refrigerator, but I always have bacon on hand, so I’m set. Thanks! Yep! Hope you enjoy it, John! I adore barley, but that’s more because I was born in Scotland than anything else. I use it in a lot of Scottish soup recipes, but can’t think of anything I use it for in Italian cooking. That said, I have got to make this soup! Sounds exactly like my cup of tea (or barley)! 🙂 Thanks again, Frank! Ok,I’m all ready,now where to I buy the beautiful soup bowls? Ah, well, anywhere you can find Deruta ceramics. The pattern is called “Raffaellesco”. What a perfectly comforting soup for the polar vortex we have been experiencing in Toronto. We love barley, I’ll be adding it to my Chili tomorrow! This creamy soup looks so good. I’ve made barley “risotto” and it’s always awesome. Another great addition to my soup rotation, thanks! You’re welcome, Eva. This one’s a keeper, I think. We’re experiencing that polar vortex, too, by the way… Brrr! I am also crazy about barley. It’s more warming and filling than rice, and I truly crave it in the winter months. When I lived in Trieste I would eat it several times a week. Great recipe and post, as always! I am loving this soup … it would be perfect for this blizzard-y day. I made it..It was delicious!!!! This post was a great read. I love Barley soup!